I purchased new throw pillows for my sofa and chairs in cream and shades of blue. I also bought some inexpensive blue glass vases, and I dug through cupboards and cabinets and found a variety of clear glass vases, glass and wood candleholders and ivory candles. It was fun to reuse items I hadn’t seen in awhile. I repainted the living room, dining room, family room, kitchen, entry and hallways—all of the public areas of the house. I changed the color from a golden wheat color to a cooler taupe color called Tumbled Stone. This gave me a whole new look immediately. In my kitchen, I have a cobalt blue glass tile backsplash, so I decided to paint one of the kitchen walls in cobalt blue. It’s amazing! As soon as the color went up on the wall, I loved it. I removed the copper-colored curtain panels in my dining room and hung cream-colored linen curtain panels instead. I had my dining chairs re-upholstered in navy blue, replacing the copper and brown fabric. I purchased two new dining chairs in navy blue leather from Crate and Barrel to add to the mix. I reused a navy blue table runner I had purchased a long time ago, and created a centerpiece with ivory pillar candles. I purchased a large cream-colored area rug for my living room to cover a good part of the brown carpet, lighten up the room, and add texture. I rearranged all of the artwork throughout the house—this no-cost update immediately changed the colors in each room. Still to come: I will be having my living room sofa reupholstered in an oatmeal-colored fabric; I will be purchasing some new artwork for the large wall in my dining room (as soon as I find something I love! ); I will be purchasing two accent lamps for my dining room to add a new layer of light and ambiance; I will be changing the photos and frames in my family photo gallery—definitely time for an update there. Redecorating always costs money, but many of the changes I made were not expensive and some were even free. Once you have the idea for your design concept, you can implement it as your time and budget allow. I am happy with the overall result in my own home so far. Now I am back to living vicariously through my design clients. Take a good look at that bookcase in your living room. How are the items arranged on the shelves? Does the bookcase look attractive or does it need help? One of the most common mistakes people make is crowding too many books and knickknacks on the shelves. Your living room can look instantly cluttered and unattractive if you let these shelves get out of control. Resist the urge to display any of the following items on your nice living room bookshelves: telephone books, photo albums (framed photos are great, but albums are best stored elsewhere), video tapes and DVDs (place them in baskets or good-looking storage boxes), loose papers, binders and notebooks. Try to find other locations for these items, such as in a home office or in a closed cabinet or closet. During a recent redesign, my client had a gorgeous dark wood bookcase with elegant fluting and lighted glass shelves. It has been placed off center on the large living room wall, but my partner and I moved it front and center, so it became the focal point around which the furniture was arranged. We carefully edited her accessories, placing books on the bottom shelves and one large, striking item on each of the glass shelves. By only using one item per shelf, each piece gained importance and commanded more attention. My client was thrilled with the final result. To arrange bookcases attractively, try to use a combination of books and accessories, and don’t be afraid to edit your accessories. To give the bookcase a more formal look, remove the dust jackets from hardback books, revealing linen book covers with gold lettering. Try to move trade paperbacks to another location in the home, as these books are not so attractive. If this is not possible, group all trade paperbacks together on their own shelves. Have some books stand upright and some books stacked lying down. A single photo or accessory can sit on the stack of books or act as a bookend. Varying the horizontal and vertical placement of books and accessories makes the arrangement more interesting. 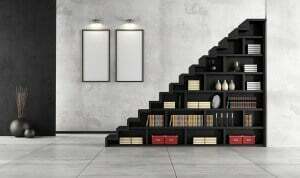 Another option is to place taller books in the middle of a shelf, and shorter books (from tallest to shortest) on either side so that they create a pyramid shape. Use bookends to hold the books in place. A small piece of art looks beautiful displayed on an easel, and silk greenery adds a nice touch to the arrangement. Family photos are wonderful to use in bookcases, but it is easy to go overboard. Keep your favorites and intersperse them among the books. Place other framed photos on side tables, or create a large photo collage to hang on the wall. I impart this advice loosely, however, as I find it as difficult as all of you do to take down cute pictures of my kids. Luckily there is no “bookcase police” to come and tell you to remove them. If they make you happy, I won’t say a word about it.Q. I just bought a new sofa with a floral pattern, and now I’m not sure what I should do with the chairs. Should they match the sofa? What about the drapes? Should they match the chairs, the sofa or should they be different? Help! A. 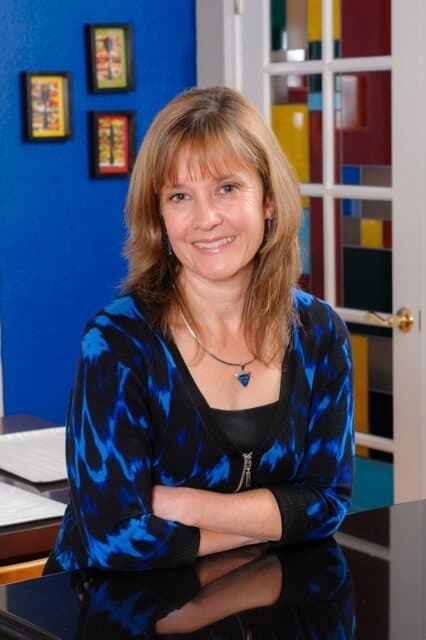 Many people find it challenging to mix different patterns. They feel more comfortable purchasing a matching sofa, loveseat and chair. Good for you for wanting to avoid that “matchy-matchy” look. Mixing colors and patterns makes a room much more interesting, and it is not as difficult as it may seem. 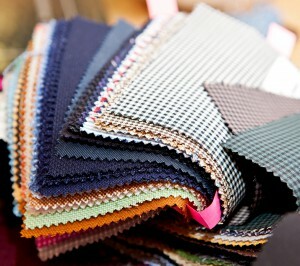 As a general rule, vary the size of the patterns by including fabrics with small-, medium- and large-scale designs. Aim for at least three fabrics—one for the sofa, another for the chairs, and the third for the draperies. Additional patterned fabrics can be used for dining room chair cushions, accent pillows and ottomans. Since the floral fabric on your sofa is large-scale, so you’ll be looking for small- and medium-scale patterns for the other pieces. Stripes and geometrics work very well with floral patterns. Using the colors from the floral-- varying shades of aqua blue, rose, green and cream-- look for a geometric design for your chairs that includes one or two or three of those colors. For example, look for a small-scale blue and green-colored diamond pattern or a raspberry and blue pin dot pattern. As an alternative, a medium-scale plaid or stripe in rose, blue and cream would also work. The two chairs should match each other, but a third accent chair can be in a different but coordinating fabric. How about luxurious velvet in aqua blue or raspberry? Although it is a solid color, the velvet provides a lovely texture. The two head dining chairs can be in the same fabric as the sofa, while the side chairs can be in the same blur or raspberry velvet. Patterns should share the same collection of colors, but do not necessarily need to have the same number of colors. For instance, you can combine a floral pattern of five colors with a geometric or stripe that incorporates three of those colors, and a tone-on-tone stripe that's just a single color. Let’s talk about the drapes. Since the walls in your living room are painted a warm cream color you have some leeway here. Which of the colors from the floral sofa would you like to see more of--the rose, aqua blue, green or cream? For a quiet look in the room, choose a cream-colored fabric that blends into the walls. Don’t try to match the wall color exactly—instead choose a color that blends well. Going a little bit darker than the wall will add some richness without adding a lot of contrast. Choosing a similar color for the drapes and the walls also helps make a room look more spacious. However if you like contrast and want the drapes to stand out more, choose rose or blue fabric for the drapes. Consider customizing your solid color drapes by adding some patterned fabric to the bottom or side hems. Tone-on-tone fabrics make lovely window treatments, as they provide pattern without looking too busy in the room. And striped fabrics are also a great choice for draperies. Make some accent pillows out of the drapery fabric for the sofa or the chairs. And while you’re at it, make one or two additional accent pillows in the chair fabric for the sofa. Pillows are a great way to tie all the furniture pieces together. Add some texture to the pillows by trimming them with a variegated fringe that incorporates two or three colors in the room. By selecting a variety of coordinated colors and patterns, your room will be unique and interesting. Bathroom remodels are one of my specialties, and by far the most common questions clients ask me are “How long will this take?” and “What should I expect during the remodeling process?” To help clients understand the process, I’ve created this sample timeline. When everyone is on the same page, the remodel process goes much more smoothly. Whether you are undertaking the project yourself, or hiring a general contractor, here is an idea of what the process will look like. A typical bathroom remodel takes 4-6 weeks. Design bathroom and select materials—you should spend a good amount of time on this step. Take your time to shop for materials and see the myriad options available to you. Peruse photos on Houzz.com and collect ideas of designs that appeal to you. It’s at this step that a professional designer can be the most helpful. A designer can help narrow down your options, and design a space that fits your taste and lifestyle. A general contractor needs to know what kind of bath you want, so the more detailed your design plan is, the more accurate his price quotation will be. Obtain permits. 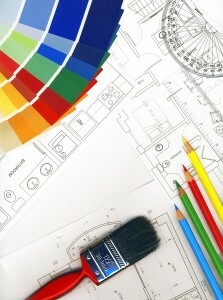 After you have your design created, take your drawings to the city to obtain any necessary building permits. The homeowner or the contractor can take care of this step. The city will want to know the type of plumbing and lighting you are using—there are strict codes regarding water flow and energy efficiency. There will be periodic inspections during the remodel process. Purchase plumbing fixtures and have them onsite. The contractor will need the plumbing rough valves and bathtub very early in the construction process. The whole process runs much more smoothly if you have all of the materials onsite before you start the demolition. Order cabinetry. Custom cabinetry takes anywhere from 4-8 weeks, and even ready-made modular cabinetry can take 2 weeks or longer. The contractor will need the cabinetry approximately 2 weeks into the process. Start demolition. Please don’t demolish your bathroom before you have a plan in place and materials ordered! Frame walls—Are any walls being moved or removed? Are you building a pony wall? Will the existing tub or shower get larger or smaller? Will you be installing grab bars? These areas need to framed and prepped. The cabinet-maker may want to come and take final field measurements after new walls are constructed, especially if cabinets need to fit into tight spaces. Install the rough plumbing. The contractor will install the tub, drains and bath/shower valves at this step. Install the rough electrical wiring. The contractor will run all of the wiring for any new lighting and vent fans at this point. Install sheetrock, tape and texture. After all of the “rough” construction, then the new wallboard can go up and be prepped for paint. Paint walls and ceiling. Most contractors like to paint before any of the finish materials go in. Painters are aware that they will need to come back at the end for any touch ups needed after the finish materials are installed. Install base cabinetry. After the walls are painted, then the vanity can be installed. Create a template for the countertop. If you are installing quartz or granite, the installers will come to measure and create a template after the vanity is installed. There is a lead-time of approximately ten days between the template date and final installation. Install tile in the shower, tub, walls and floor. If you are installing a tile backsplash, this cannot be completed until the counters are installed. Measure for bath/shower enclosure and custom mirrors. The enclosure cannot be ordered until the tile is complete. There is typically about a 10-day lead-time for these items. Install countertop. After the 10-day lead-time, the counters can finally be installed. Now you can schedule the backsplash installation. Install final plumbing and light fixtures. After all of the tile work and countertop work is complete, then the contractor can install the bath/shower fixtures, faucets and decorative light fixtures. Install bath/shower enclosure and mirrors. Now your bath is almost done! Install cabinet doors and hardware. Many times, the contractor will wait till the end to install these items—this reduces the chance of damage to the cabinetry while other items are getting installed. Install towel bars, tissue holder, robe hooks and other accessories. Call painter back for final paint touchups. Add finishing touches—window treatments, artwork, towels. Bathroom complete! Although it always seems like it takes forever, a few weeks of inconvenience will result in years of enjoyment. I changed the color scheme from brick red, copper with hints of green and gold, to brown, cream and navy. I didn’t want to buy new furniture, but I was willing to buy some new accessories and accent pieces. Redecorating always costs money, but many of the changes I made were not expensive and some were even free. Once you have the idea for your design concept, you can implement it as your time and budget allow. I am happy with the overall result in my own home so far. Now I am back to living vicariously through my design clients. Take a good look at that bookcase in your living room. How are the items arranged on the shelves? Does the bookcase look attractive or does it need help? One of the most common mistakes people make is crowding too many books and knickknacks on the shelves. Your living room can look instantly cluttered and unattractive if you let these shelves get out of control. Resist the urge to display any of the following items on your nice living room bookshelves: telephone books, photo albums (framed photos are great, but albums are best stored elsewhere), video tapes and DVDs (place them in baskets or good-looking storage boxes), loose papers, binders and notebooks. Try to find other locations for these items, such as in a home office or in a closed cabinet or closet. During a recent redesign, my client had a gorgeous dark wood bookcase with elegant fluting and lighted glass shelves. It has been placed off center on the large living room wall, but my partner and I moved it front and center, so it became the focal point around which the furniture was arranged. We carefully edited her accessories, placing books on the bottom shelves and one large, striking item on each of the glass shelves. By only using one item per shelf, each piece gained importance and commanded more attention. My client was thrilled with the final result. To arrange bookcases attractively, try to use a combination of books and accessories, and don’t be afraid to edit your accessories. To give the bookcase a more formal look, remove the dust jackets from hardback books, revealing linen book covers with gold lettering. Try to move trade paperbacks to another location in the home, as these books are not so attractive. If this is not possible, group all trade paperbacks together on their own shelves. Have some books stand upright and some books stacked lying down. A single photo or accessory can sit on the stack of books or act as a bookend. Varying the horizontal and vertical placement of books and accessories makes the arrangement more interesting. Another option is to place taller books in the middle of a shelf, and shorter books (from tallest to shortest) on either side so that they create a pyramid shape. Use bookends to hold the books in place. A small piece of art looks beautiful displayed on an easel, and silk greenery adds a nice touch to the arrangement. Family photos are wonderful to use in bookcases, but it is easy to go overboard. Keep your favorites and intersperse them among the books. Place other framed photos on side tables, or create a large photo collage to hang on the wall. I impart this advice loosely, however, as I find it as difficult as all of you do to take down cute pictures of my kids. Luckily there is no “bookcase police” to come and tell you to remove them. If they make you happy, I won’t say a word about it. Q. I just bought a new sofa with a floral pattern, and now I’m not sure what I should do with the chairs. Should they match the sofa? What about the drapes? Should they match the chairs, the sofa or should they be different? Help! room much more interesting, and it is not as difficult as it may seem. As a general rule, vary the size of the patterns by including fabrics with small-, medium- and large-scale designs. Aim for at least three fabrics—one for the sofa, another for the chairs, and the third for the draperies. Additional patterned fabrics can be used for dining room chair cushions, accent pillows and ottomans. Since the floral fabric on your sofa is large-scale, so you’ll be looking for small- and medium-scale patterns for the other pieces. Stripes and geometrics work very well with floral patterns. Using the colors from the floral– varying shades of aqua blue, rose, green and cream– look for a geometric design for your chairs that includes one or two or three of those colors. For example, look for a small-scale blue and green-colored diamond pattern or a raspberry and blue pin dot pattern. As an alternative, a medium-scale plaid or stripe in rose, blue and cream would also work. The two chairs should match each other, but a third accent chair can be in a different but coordinating fabric. How about luxurious velvet in aqua blue or raspberry? Although it is a solid color, the velvet provides a lovely texture. The two head dining chairs can be in the same fabric as the sofa, while the side chairs can be in the same blur or raspberry velvet. Patterns should share the same collection of colors, but do not necessarily need to have the same number of colors. For instance, you can combine a floral pattern of five colors with a geometric or stripe that incorporates three of those colors, and a tone-on-tone stripe that’s just a single color. Let’s talk about the drapes. Since the walls in your living room are painted a warm cream color you have some leeway here. Which of the colors from the floral sofa would you like to see more of–the rose, aqua blue, green or cream? For a quiet look in the room, choose a cream-colored fabric that blends into the walls. Don’t try to match the wall color exactly—instead choose a color that blends well. Going a little bit darker than the wall will add some richness without adding a lot of contrast. Choosing a similar color for the drapes and the walls also helps make a room look more spacious. However if you like contrast and want the drapes to stand out more, choose rose or blue fabric for the drapes. Consider customizing your solid color drapes by adding some patterned fabric to the bottom or side hems. Tone-on-tone fabrics make lovely window treatments, as they provide pattern without looking too busy in the room. And striped fabrics are also a great choice for draperies. Make some accent pillows out of the drapery fabric for the sofa or the chairs. And while you’re at it, make one or two additional accent pillows in the chair fabric for the sofa. Pillows are a great way to tie all the furniture pieces together. Add some texture to the pillows by trimming them with a variegated fringe that incorporates two or three colors in the room. By selecting a variety of coordinated colors and patterns, your room will be unique and interesting. Bathroom remodels are one of my specialties, and by far the most common questions clients ask me are “How long will this take?” and “What should I expect during the remodeling process?” To help clients understand the process, I’ve created this sample timeline. When everyone is on the same page, the remodel process goes much more smoothly. Whether you are undertaking the project yourself, or hiring a general contractor, here is an idea of what the process will look like. A typical bathroom remodel takes 4-6 weeks.